According to the local police, the Bidhannagar Cyber Crime wing of the Kolkata Police was looking for the accused for almost a year. Accused: M. Vijay Kumar Mandal, S. Baskar Kumar and R. Juhendaer Kumar Mandal. Chennai: One of three men accused of hefty cash withdrawals through fake ATM cards and arrested by the Kolkata cybercrime wing in Chennai in the early hours of Sunday escaped from the police station in the evening. The accused trio had been brought back from court to the Triplicane police station when the man, who had asked to go to the toilet, broke free just as he was being escorted by a cop. The Cyber Crime wing of the Kolkata Police had on Sunday arrested three North Indian men at Triplicane, allegedly for swindling money using fake ATM cards. The arrested were identified as M Vijay Kumar Mandal (22), S Baskar Kumar (25) and R Juhendaer Kumar Mandal (23), all hailing from Jharkhand. According to the local police, the Bidhannagar Cyber Crime wing of the Kolkata Police was looking for the accused for almost a year. Sources said the trio had hacked ATM numbers and passwords of more than 100 people and used fake cards they had prepared to withdraw money. 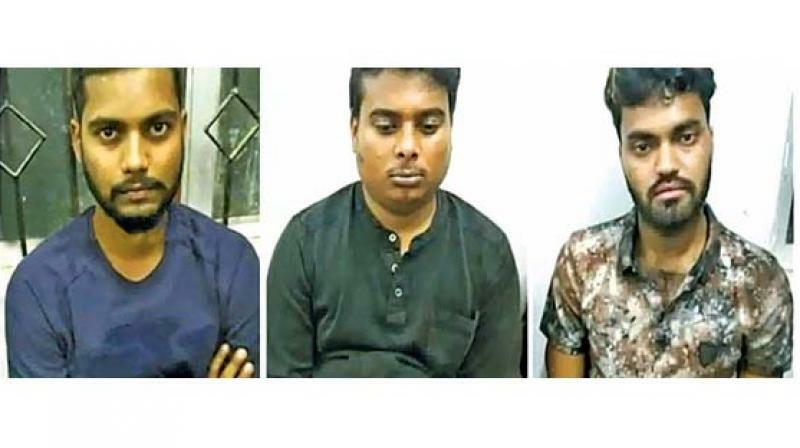 "The Bidhannagar cyber crime police of Kolkata police arrested one of their gang members at Kolkata and the trio learning about his arrest fled the state and reached Chennai a month ago," said a police officer. Based on a specific tip-off, the Kolkata police got to know that the trio were staying at a hotel at Chepauk in Triplicane, the police said. With the help of the Triplicane police, a team of six police officers from Kolkata, led by Inspector Choudhury, arrested the trio in the early hours of Sunday. The police said that the men had used one of the fake ATM cards in the hotel and were staying in a room. On searching their room, the police recovered `25 lakhs and 32 fake ATM cards which they had prepared to swindle money. After being produced before the magistrate at Egmore and receiving the transit warrant, the men were handed over to the Kolkata police. Sources said when the three policemen were at the Chennai central railway station, the accused were at the Triplicane police station. Meanwhile, at around 5 pm, Baskar Kumar had gone to the toilet, escorted by a policeman and he pushed him and fled the police station after jumping over the compound wall. A senior police officer confirmed that Baskar had escaped and said that a team has been formed to nab him. Further investigations are on.